You will recieve two pyramids, one black and one white. Inside each device a put a base mix of 5 Double Terminated Quartz Point, Kyanite, Selenite, Quartz Powder, Shungite, Pyrite, Aluminium, Copper, Titanium, Tin, Brass and Sun Dried Colloidal Silver. 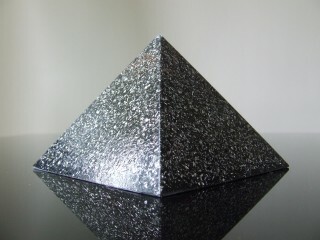 This grounding Ying and Yang Orgonites Black and White pyramids balances energies around the area of the pyramid wherever they are. You will receive one Black and One White pyramid. Inside the devices I have placed crystals that react with each other thus creating 1 positive and 1 negative pyramid, dont worry they wont create negative energy, I use the crystals to create a reaction so they are more powerful. This is one of the most beneficial combinations and the one I receive the most positive comments from. The pyramids protect the rooms of the home when placed at opposite sides of your room, bed, sofa etc. Jet, Black Tourmaline, and Obsidian block any negative energy present. Haematite grounds the energy of the room and person. Lodestone and Magnetite harmonize the energies in the body and space. The modern world we live in has many dangers; cell phones are just one of them. They are a major energy drain and even harm the brain with their radiation bombardment. This pyramid prevents that by using Black Tourmaline and Kyanite to block the radiation while Topaz, Labradorite, Quartz and Selenite clear the mind and balance energy. Now the Danburite and Mookaite both physically and emotionally. Electricity leakages from TV’s, Microwaves etc. I decided to make this Pyramid to combat all of these atrocities they are bringing upon us I have combined the following crystals together because of their healing capabilities towards radiation and our immune system they are: Black Tourmaline, Kyanite, 5 x Clear Quartz Points, Selenite, Danburite, Labradorite, Topaz, Mookaite, Lapis Lazuli, and Sodalite. 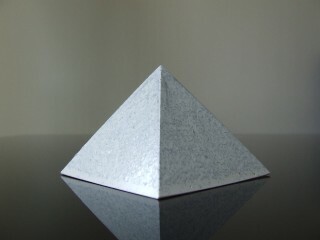 All of my devices will also give you the ability to achieve a deep state of meditation, this usually takes many years, and however this Photon Orgone Pyramid you will be able to achieve a deep Zen monk like state of meditation within months, by following my simple meditation and manifestation guide. Holding and meditating with the Photon Orgone Pyramid you will be able to achieve a very deep meditation state very fast. Hi Suli, these two are very special together, from the white one I feel everything is ok right now there is a patient or observer energy here... 'it doesn't matter' also there's no need to speak or express every thing is just as it should be right now and in 5 seconds time everything will be just fine right then in what dimension and space in which in exist.